Image: Prof. Nancy Rothbard shared her research on how social media can lead to complicated workplace relationships. “There is no universe that exists where a rational man or woman ought to be willing to pay more for the same product — but it does,” said Wharton Professor Americus Reed, II pointing to a slide showing a generic pain reliever that costs nearly 40% less than name brand Tylenol. “A brand is not just a picture, a tagline, a logo. A brand is a meaning system. A brand tells you something about what you should believe about why it exists,” he said, explaining why people are willing to pay top dollar for a brand, even though regulations require that the generic is the exact equivalent of the brand. Prof. Americus Reed, II walks down the aisle at the Barnes Foundation during his talk on the power of brands on Wednesday, January 23, 2019. Thus began one of four 15-minute, rapid-fire, TED talk-like presentations by Wharton professors that turned the expansive atrium of Philadelphia’s world-renowned Barnes Foundation into a temporary classroom for the evening. 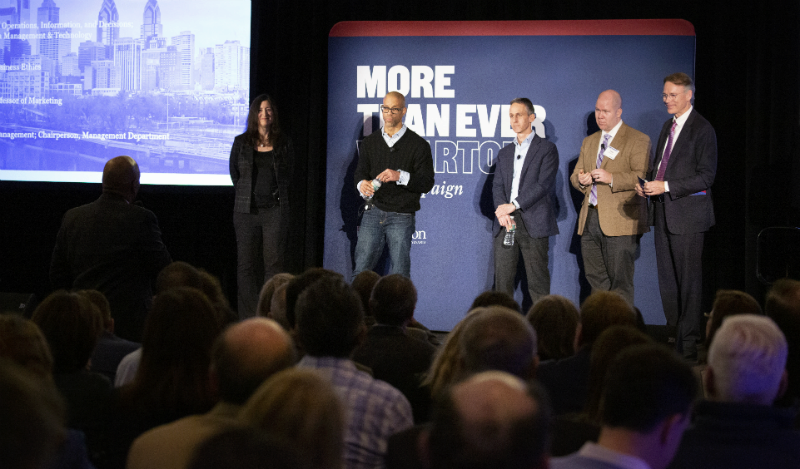 And so on Wednesday, January 23, Wharton Lifelong Learning hit the road for the five-city More Than Ever Tour, designed to connect Wharton alumni to the latest cutting-edge research from Wharton faculty. After the 180 alumni attendees explored the Barnes galleries and then took their seats, in quick succession, Profs. Gad Allon, Peter Conti-Brown, Americus Reed, II, and Nancy Rothbard stepped on stage to present their insights on modern finance, the power of brands, risks of social media, and motivations within the gig economy. Profs. Nancy Rothbard, Americus Reed, II, Gad Allon, Peter Conti-Brown, and Vice Dean Sam Lundquist take questions following the presentations. When Prof. Gad Allon asked how many people in the audience have used a ride-sharing app in the last year, hands shot up in unison. That should come as no surprise as Uber, Lyft, Postmates, DoorDash, and a slew of others have become inescapable utilities in recent years. What’s more surprising are the behavioral aspects that motivate people to continue to work in the gig economy. To investigate this, Gad Allon and his researchers tracked the behavior of approximately 8,000 drivers working for the ridesharing company Via for one year. “When drivers get closer to a certain income, we see a surprising outcome, which is that you pay them more and they are less likely to come and work. If they start working a shift, they are going to work fewer hours. We have seen it across drivers, across types, and in a very robust way,” he said. Wesley Lim, WG’18, an equity analyst at Cooke & Bieler, attended the event to meet fellow alumni and learn something new along the way. 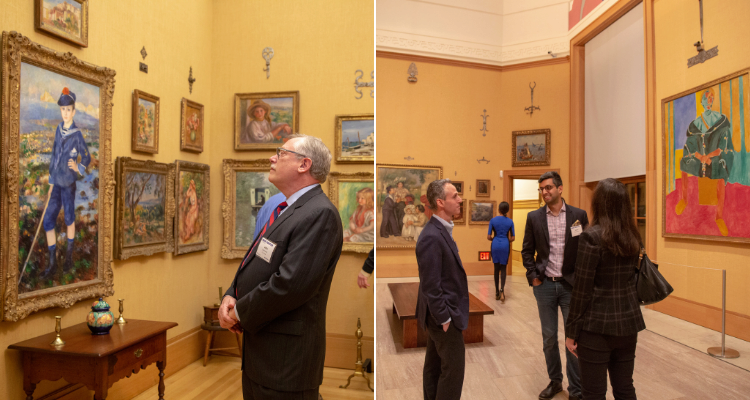 Attendees had the opportunity to tour the world-renowned Barnes Foundation collection during the kickoff of the More Than Ever Tour. The evening also served as an opportunity for alumni to learn more about the goals of the More Than Ever campaign. Sam Lundquist, Vice Dean of External Affairs, spoke about the three key focus areas for Wharton: future of finance (think: fintech, blockchain), analytics (including marketing, customer, people, and neurological analytics), and expanding Wharton’s resources for entrepreneurship and innovation. Other major thrusts of the campaign include financial aid, research funding, and new centers for learning. “Physical spaces bring people together. They allow them to meet accidentally, they provide resources required to get a job done,” said Karl Ulrich, Vice Dean of Entrepreneurship & Innovation, during a campaign video that shown at the event. Preview designs of the Wharton Academic Research Building (already under construction at 37th and Spruce Sts.) and Tangen Hall appeared in the video and on screens surrounding the reception area. The More Than Ever campaign will transform Wharton for the 21st century, bolstering the people, the research, the partnerships, the education, and the spaces that spark great ideas and bring them to global scale. Learn more at giving.wharton.upenn.edu.